"Mail art meets virtual worlds" is an exhibit by Alana Pyara. It is part of the Linden Endowment for the Arts full region grant season. The purpose of the exhibit is to find new ways for people in the virtual worlds to communicate and express themselves by exploring techniques often used in mail art. Everyone and anyone can participate. Read more: http://mailartmeetsvirtual.blogspot.com/. For the opening event of this art region, we have a real treat for anyone interested in virtual worlds and the identities of both players and characters. State of Being is a popular lecture by Pamala Clift, "a researcher and an autodidactic observer of psychology and anthropological interactions". 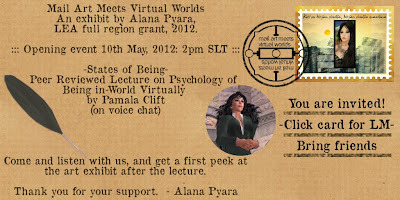 The lecture will be held in voice chat. Please familiarize yourself with how voice chat works before the event. There is no cost to attend this event.